One of many spin-offs to come out of Nintendo's Pokémon phenomenon, the Rumble series takes toy versions of Game Freak's famous monsters and throws them into simple, action-packed beat-'em-ups. The 3DS has already played host to Pokémon Rumble Blast, but following in the free-to-play footsteps of the recently released Pokémon Shuffle, the latest title in the series - Pokémon Rumble World - is a free-to-download eShop exclusive. 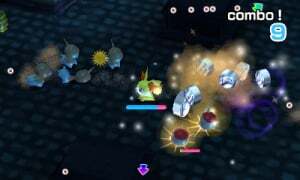 While that low price includes optional microtransactions, this is no Team Rocket scam - Rumble World's pricing model is pleasantly palatable, and with fun gameplay and connectivity features, this freebie deserves a download on any Pokémon fan's system. 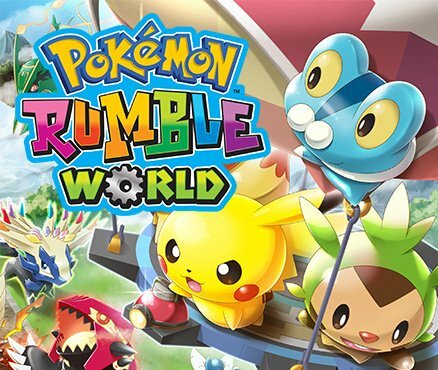 As with every game in the Rumble series, Rumble World tempers its beat-'em-up gameplay through a toyland conceit: your Mii is transported into the Kingdom of Toys, where toy Pokémon roam wild and free. The King of the realm, sadly, has only a single Pokémon to his name and - after outfitting you with his personal Pikachu and a hot air balloon for travel - tasks you with expanding his collection. The basic gameplay remains largely unchanged from Rumble's WiiWare beginnings: playing as the toy Pokémon of your choice, you'll move through simple, semi-randomized paths, encountering sizeable same-species swarms of Pokémon along the way, which you'll defeat with simple "mash 'A'"-style combat. After clearing a few different rooms, you'll come to an arena holding the boss - a larger, more powerful Pokémon accompanied by an endless supply of minions. 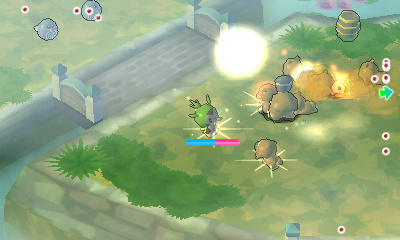 Sometimes, instead of disappearing in a flash of light, the Pokémon you defeat will turn into tinier toy version of themselves, which can be picked up and added to your team. You can switch between Pokémon on the fly with a quick press of the X button, and you'll want to switch often as you encounter different foes - the series' trademark Type advantages come into play here, and planning your strategy around 'Super Effective' moves is a surefire way to clear out packs of enemy Pokémon. Beyond Types, the individual Pokémon makes a difference too - each monster you find will have different power ratings and different moves, so you might find one Treecko who fights with 'Tackle', another who uses 'Absorb', and another that whips out 'Razor Leaf'. Some Pokémon even come with special Traits that bestow bonuses, like our Healthy Horsea, who restores HP naturally, or our Turbo Weepinbell, who essentially emulates a turbo button for rapid-fire attacks. Between Traits, moveset differences, and the fact that all 700+ currently known Pokémon are present in the game, "catching 'em all" might be a stretch - but it's always exciting to see what you come back with. Catching new Pokémon does feel like the main draw of the game, but the combat - while very simple - is surprisingly fun too. It's definitely repetitive, and button mashing will certainly carry you through most battles, but there are some nuances that make battle more satisfying than you might think. Some attacks (like 'Tackle') hit straight ahead, for instance, while others (like 'Razor Leaf') carve out a hitbox that circles around your Pokémon, and some (like 'Twister') only start dealing damage a few feet away from your 'mon - great for keeping foes at bay, but useless point blank. You'll also find defensive moves, as well as buffs and debuffs that do everything from reduce damage or inflict status conditions to change a Pokémon's Type. So far, Rumble World sounds very similar to its 3DS predecessor, Rumble Blast, but it differs substantially in how it's structured. Rather than spread out on a world map or arranged in a linear progression, the levels in Rumble World are accessed via special Hot Air Balloons - and that's where the game's free-to-play system comes in. Balloons - there are eighteen in total - whisk you away to different themed areas, with several sub-levels available to explore from each Balloon. If you hop aboard the Sapphire Balloon, for instance, you'll be able to land in one of four stages - selected semi-randomly via a roulette system - which feature mostly Generation III Pokémon from Ruby and Sapphire. The Dew Balloon, meanwhile, takes you to lands teeming with Water-type Pokémon, while the Origin Balloon drops you off in the stomping grounds of the original Kanto 150. All Balloons need air, however, and after you use one, it will take some real-world time to recharge before you can hop in again - anywhere from a few minutes to a few hours, depending on the Balloon. At the outset of your adventure, you'll get a starter Balloon for free, but after that you'll need to buy more with Poké Diamonds. This is Rumble World's in-game currency of choice, and though they're purchasable with real-world money - at the rate of $0.69/€0.69/£0.69 for 50 Diamonds, with substantial bulk discounts for higher quantities - you'll also pick up plenty just by playing the game. They're used not only to buy new Balloons, but also to grab certain items and upgrades, as well as instantly reinflate a Balloon if you don't feel like waiting. Happily, however, Rumble World's timer-based model feels remarkably unrestrictive - we never once felt compelled to pump up a Balloon with Poké Diamonds, and we weren't left waiting around because of it. For starters, there's a whole suite of Challenge stages at the castle that can be played without using a Balloon at all. These missions involve specific requests from the King, such as beating a boss, protecting a Mii, or winning a Battle Royale, and completing them will earn you Poké Diamonds. Each Challenge also comes with smaller subgoals - like using super effective attacks, clearing the mission in a certain time, or racking up a high combo - which will earn you even more Diamonds as you check them off. Though you can't capture any Pokémon in the Challenges, you can play each mission as many times as you like - and try them on Hard mode for even more Diamonds after clearing them once. As with Pokémon Shuffle, we'd argue that there's no real need to throw any real money at Rumble World; it doesn't take long to build up a respectable fleet of Balloons, and with the Challenges playable and replayable at any time, there's always something fun to do while you're waiting. That said, players who do feel like splashing out on Poké Diamonds can do so without worry of falling too far down the rabbit hole; Nintendo's placed a hard cap of 3,000 Poké Diamonds on your total purchasing power, which comes to around $30/€30/£27, depending on what quantities you buy them in. It's a nice touch that's indicative of a much more muted microtransaction system than the one found in Pokémon Shuffle; the only mildly scummy feature is that you'll be prompted for 2 Poké Diamonds to continue where you left off if you end up failing a mission, which - considering you'll still keep any Pokémon you captured regardless - is simply never worth it. Even after you've exhausted all your Balloons and overcome the available Challenges, there's still more to do in Rumble World, especially if you're into customization. Aside from Hot Air Balloons and upgrades, the castle store sells everything you need to kit out your Mii in style, including clothes, costumes, backgrounds, and frames that can be purchased with Poké Coins (the abundant in-game currency that drops from defeated Pokémon), Poké Diamonds, or unlocked by ranking up from capturing lots of Pokémon. With these items in tow, you can create a personalized diorama with your Mii and up to three companion Pokémon, and share it with the world via StreetPass. Profile swapping, while surprisingly addictive, is just the start of Pokémon Rumble World's extensive connectivity features. You can populate your castle plaza with Miis you meet not only from StreetPass, but also from your 3DS Friend List (via SpotPass), and by calling random players in over the internet once per day, ala Bravely Default. This is a great feature in and of itself - we'd love to see more games with asynchronous play tap into the Friend List in addition to StreetPass - but what's really impressive is how well the visiting Miis are integrated into the gameplay. 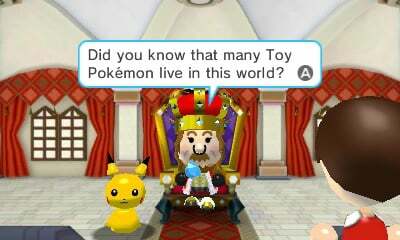 Once a Mii appears in your plaza, you can talk to them to see their profile card and diorama, learn about their companion Pokémon, and even hitch a ride to their favourite area - a great chance to pick up some rare monsters - in exchange for Poké Coins or Poké Diamonds. You'll pick up bonus Diamonds for reaching certain hospitality milestones, and you might also find your friends working in your castle store, recommending outfits and backgrounds, or playing different parts in the cutscenes that introduce the King's Challenges. Best of all, you'll routinely run into Miis while roaming the dungeons, and if you can save them from wild Pokémon pursuers, they'll follow you around for the rest of the stage, slinging helpful support items like X Attack or Potions. Seeing your friends running the shop, walking around the plaza, and exploring the dungeons adds a wonderfully personal touch to Rumble World that makes it fun to check in just to see what everyone's up to. In fact, with a steady stream of Miis coming in from StreetPass, SpotPass, and the wider world, it feels a bit like a lost StreetPass Plaza game, and the Mii integration goes a long way towards keeping things fresh and fun as you play. In terms of presentation, Rumble World goes for adorable art direction over technically impressive graphics, and it does a good job making everything feel accessible and fun. The chunky character models and low-poly Pokémon are endearing, and work well within the toybox theme, though the backgrounds are a bit hit or miss; there are some truly beautiful stages - like a treetop level with paths winding through a multilayered canopy - but far too many are forgettable. The same inconsistency applies to the stereoscopic 3D effect, too: it's put to great use in profile dioramas and when captured Pokémon go flying in towards the screen, but it's entirely absent from the pre-Challenge cutscenes. Overall, however, the aesthetic wins out - Rumble World isn't a gorgeous game, but it's certainly appealing. The music follows suit, with upbeat, bouncy tracks, and while there's nothing particularly 'Pokémony' about it - no main series remixes here - it's catchy and fun. Pokémon Rumble World takes the basic beatdown gameplay the spin-off series is known for and combines it with fun connectivity features that give it a uniquely social feel. It's not a particularly deep experience, but the blend of button mashing and creature collecting makes for satisfyingly straightforward fun. The toy Pokémon are adorable, the simple combat is accessible and enjoyable, and the level progression system is perfect for playing in short bursts - add in a genuinely generous free-play model, and there's no reason not to give it a go. I dl'ed it but have yet to play it even though I have about 50 hours on Shuffle. Too many games to play atm and the far future. I tried this one out but I really couldn't get into it. Oddly enough, I think I enjoyed Shuffle much more. While it's better that you won't miss out on much if you don't spend money, I'm still not downloading this on principle. I refuse to support f2p and I won't give Nintendo the satisfaction of my download being added to the tally. Hopefully in the future they will rstrict this sort of thing to their mobile app games. Mutch prefer it to the WiiU game... i hated how the WiiU Rummble was All arena baced.. I really like this one. I'm not really into puzzle games, so Shuffle didn't do anything for me. But a plain beat 'em up is great for those times when I know I can't hash out a full fight in MH4U. But as a working father, short bursts of gaming suit me. I really didn't enjoy my time with either this or Pokemon Shuffle. Free-to-play games just aren't ever fun, based on my experiences. I'd definitely much rather spend my time playing one of the quality titles that I've paid for. Good review. It really is a fun little game, a much fuller and richer ecperience than Pokemon Rumble U which my kids finished in 2 days, 2 hours per day, and that cost $18. Even the 3D effect where Pokemon toys you capture seemi gly fly out of the screen towards you is nice, I dont think Shuffle has any 3D at all. All that said, after 3 years of free to play games on tablets this is the first game Ive ever come across that feels like free to start. I just dont see how its possible to get enough diamonds to purchase those 100 cost balloons. I suppose there could be enough kings challenges to get you there but Id die of old sge before that. Shuffle I think Ive finished twice now - based on defeating the last Pokemon on the main screen. 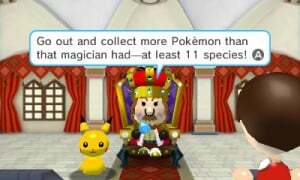 And it never even occurred to me to spend money on the gsme, I syill have 14 jewels. With Rumble Im stuck replaying the same balloons over and over again, dealing w/ that stupid roulette ststem which udually lands on the 1 no star island while the other 3 have 2 or 3 stars. If the king gave you 5 jewels every day just b/c, and you could esrn more easily, Id say this was an excellent free to play game, but instead afyer all these years Nintenfo has finslly taught me what free to dtsrt means, which is funny as its the derogatory term Iwata said we'd never get. Good game, but they might as well be transparent and put $ dollar signs next to those high level balloons - $1, $3, $5 - and stop pretending w/ the diamond purchases. It is really fun but it makes me wish for a AAA action-based combat spinoff. This is an 8 for me as well, but Pokemon Shuffle is like a 9.5 or 10, and has taken all my spare time and Pokemon energy. I still have Rumble World and check in every day but don't play it often anymore after doing the first couple balloons a few times. It's not that it's not great, I just have better options at the moment. (I just downloaded Xenoblade 3D, and also trying to play Pokemon mystery dungeon simultaneously). My 8 year old son and wife play both Pokemon Shuffle and Rumble World at least an hour every day. We have never spent money to get more diamonds or jewels, but I may someday just to pay for our enjoyment of the games. Accidentally released my Groudon with red orb, rage uninstalled immediately. Got a good 30hrs out of it though, but around that time in the game the earnable gems begin to dwindle. I couldn't justify the time to fun ratio. It's odd because I wholeheartedly support f2p done right, but I hit the inescapable wall that a bad f2p has. I think one amusing effect that a f2p game has on a gaming experience (and the gamer psyche) is that the time you spend playing the game earning premium currency feels like earning money, which is a very clever technique. A good f2p should be able to hide that. However, for my spice, PRW reaches a point where all I can see is this premium currency, and my lack of it. Shuffle, in contrast, has never had the same effect on me. Clever f2p cop-outs like the meowth stage mean that I haven't even thought about, or used the jewels (premium currency) in the game. Obviously shuffle's persistence of gameplay is seen in monthly competitions. It surprises me PRW didn't go down this route. I final difference is that I feel I can complete Shuffle, in a way I can't for PRW. The Sisyphean task of collecting 700+ pokemon off the bat is daunting and off-putting, whereas the drip feed content of Shuffle always keeps your mouth below the faucet! @TeeJay So are you saying that if the game was say 4.99 to 7.99 you'd be more inclined to purchase it if that gave you all content? I just caught Zekrom and it only cost 9 Gems. That's like, ONE King's Favor. @BieberBlows Not really the same thing but Pokken Fighters is coming out soon and that looks like a really cool 3rd person fighting game. I'm quite enjoying this game. It's fun to play for a few minutes at a time, but it isn't great to play for long periods at a time unless you want to waste Poke Diamonds. My main complaint is that it costs a lot of Poke Diamonds to get all of the balloons in order to go to all of the areas and get all of the Pokemon. @PokeNas It is a full game. You can beat it without paying a penny/cent if you so wish. You're only spending money on the higher cost balloons which is only if you want to collect all the Pokemon, again, an optional feature. I've gotten all the way to rank 25 and counting without spending any real money. Also, how is one or two people going to make a difference by not downloading it? One or two downloads is nothing, it's a pointless effort. You might as well give it a fair try instead of just going "Hurr, dey wants mah moneyz, nope". I dl'ed it and all I can say is, it is an okay game so far. However, I won't pay for this one. I'm not so much into it. Dang. I was really hoping "free to start" meant purchasing permanent content in little packs. Even if it's well-priced, I absolutely refuse to spend any amount of money on something that gets used up. So yet again, it's a game I'll play and never give a single cent to Nintendo for. I want to support the game, but I can't support the model. Frustrating. 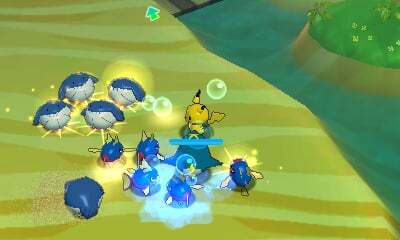 I really enjoyed the first 3DS Pokemon Rumble, so naturally I was happy to see a genuinely enjoyable semi sequel here and not just a quick F2P cash in. The social features are some of the best on the handheld (short of offering actual multiplayer). @TeeJay Fair enough. I've dl'ed and quite enjoyed it and not paying for it feels more like a gift from Nintendo. I also think dl'ing it and not spending money is more damaging. I dl'ed 4 times in our home and this will tell Nintendo we will play your games for free but not pay for this stuff. Wait, people are refusing to even download out of principle? Now I'm seriously considering downloading it on my two older 3DSes just to cancel that out and encourage Nintendo to keep doing these types of games. Because I think it was inevitable the big companies will have to make some F2P games to stay afloat and this one did so much right. I've spent $2 and have all but a few balloons, I can easily see getting them all for $5-$10 and careful gem budgeting. And this game probably would've cost at least $15 if it wasn't f2p. Even without paying money, I got a good portion of the balloons. I think this is quite generous, and fun as well! I've got a lot of play out of it and I'm currently rank 54. I'd maybe drop the score to a 7 personally though because if you're out of diamonds it can be frustrating playing roulette to play the stage you need to. @ShadJV Exactly, it's ridiculous! Offering games for free isn't harming anyone! You don't HAVE to pay money and if no one did, Nintendo would still be raking it in off other products! It's a win/win! I find Shuffle more fun, but it seems you can do a little more in this game before having to wait. I've been enjoying Rumble, but I hate its system. Every 30 minutes to several hours you get to spin the roulette and try and get the level you want, which might have the Pokemon you're looking for, which you might catch if you're lucky. It's a chance at a chance at a chance, and I found it very annoying, especially since you have to catch new Pokemon to advance. I've progressed enough that I won't be getting any new areas anytime soon too. I need another 41 diamonds to unlock the next area, and with the challenges' difficulty rising faster than the level of the Pokemon I catch, it will be weeks before I have enough. Overall, the game is okay, but it feels like it's built to pressure you to buy diamonds (which I'm sure it is). I'd probably give it a 6/10. Ok, so up until now I have always been staunchly anti-F2P, but after playing this game I'm warming up to the concept. Maybe it's because this game is so much deeper than your average iPhone game (not that the game is extremely complex or anything, but it is a quality title and not just some cheap $2 game), and has a much higher free play to pay ratio than most I've seen up until this point. Basically, you know they did a good job if they got ME to like a F2P game. And I'm not even into Pokemon! Eh still not getting it good review though. Just like Shuffle, I enjoyed this! This one seems to have a lot more longevity than Shuffle, though. @JaxonH Yeah, I was the same, especially after playing the SoulCalibur and Tekken F2P games (don't bother). It's easily the best F2P title I've tried. I'll definitely download this,unlike Pokèmon Shuffle. Had a hard time getting into this, honestly. Pokemon Shuffle is so much better. I've played for over 5 hours so far and have neither spent any real money nor felt required to do so. At a couple of points, I was unable to use any balloons, but after going back to a Challenge or two for more Diamonds, I was able to proceed as usual with tangible rewards. And although sometimes a battle will not be particularly rewarding, even releasing unwanted Pokemon will reward the player with in-game currency. I'm not sure if this is "F2P done right," but it is much closer to the positive end of the spectrum than the negative. Some of those balloons will take more time to get than preferable, but even a 100 Diamond balloon is not that hard to get when you can get 5 Diamonds for turning the game on once a day and another regular supply via Spotpass in addition to the various challenges that give over 10 each. I'm putting this under the same category of "Nintendo did a decent F2P thing" as Steel Diver and Rusty's Real Deal Baseball. I don't necessarily look forward to more games in this model, but they won't necessarily be wrecks either. 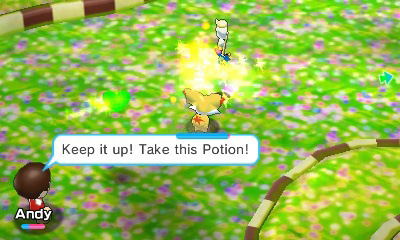 Now I feel even stupider for actually purchasing Pokemon Rumble Blast. This one sounds good enough that I wouldn't mind giving the series another chance after being nearly bored to death by that one. The beginning of this game is extremely generous with the F2P deal. you have to buy Poke diamonds. But the thing I like is, poke diamonds are relatively inexpensive. I won't have to purchase the maximum amount of gems you can purchase ($32) to beat the whole game. I just adore the pokemon models, and I <3 games with collectibles. @zipmon Prince and the NPG reference in the byline! Woo! I agree with this review for the most part but the F2P elements are mildly annoying if you're playing it for free. It takes several days of playing to even get 10-20 Diamonds for free, so when you start seeing balloons that take over 100 to buy it starts getting a bit too grindy. It'd probably take you months to buy every balloon at that rate. Not sure about this one. Still have a huge backlog so no need to get it. I was pleasantly surprised with this. I was initially skeptical about having a Rumble game as F2P, as I really like the previous games (especially Blast) and was looking forward to a "full" release of a Gen 6 Rumble game. However, I found this game is great in short bursts. I'm content with playing until I'm out of balloons and then taking a break, and there are plenty of opportunities for free diamonds, so I can get all the fun out of it without paying a dime. "I refuse to support f2p and I won't give Nintendo the satisfaction of my download being added to the tally"
I can understand your sentiment (I am also not a free-to-play fan), but it won't change much. I mean for example: If only 1000 people downloaded it, Nintendo can still say it was over 2000 people! Well, I downloaded it and it isn't that bad. However, I prefer Nintendo to spend their time and money on a full-scale, retail Metroid or F-Zero instead!! I don't like the free to play model in general I think it's companys and developers completely ripping gamers off, some of the FTP models I've seen should be Criminal . Nintendo Hit a home run with this one in my opinion and I think they give the BEST MODEL of FTP I've ever seen with this game as well I have been having a BLAST playing this game I completely agree with the REVIEW above I've never owned or played through a Pokemon game but I really really like this game it's a great little game , I'd highly RECOMMEND this title it's an AWESOME pick up and play I like it so much I spent Ten dollars on diamonds just to SUPPORT the title . If Nintendo releases anymore FTP with the same model as this one I think it would be a good thing and I'd definitely support it . I dl'ed it, but haven't gotten into it much. I'm annoyed at the roulette wheel format instead of being able to pick the area you want to go directly. The game can put you in a area where you caught all the Pokemon already if it so chooses. With the 3DS retail version you can freely pick whatever level you want, which I think is a better format. I thought Rumble Blast was a somewhat better game overall, but I still didn't beat it. Not being able to level them up made the final area unbeatable for me. I had caught mons from the latest stages, but the random power levels made the ones I caught not strong enough for the final area. @Will-75 I hope I don't come off sounding judgemental, I just want to point out that there is a 3DS retail version called Rumble Blast. In my opinion, buying the retail game is a better way to show your support for this spinoff series rather than spending any money on the diamonds. I would personally play this version for free as it's marketed or not at all, but maybe that's just me. @TeeJay I don't understand the principle of opposing free-to-play. Explain how trying a game for free is essentially worse than playing a short demo for a $40-$60 game you have to pay upfront instead of small chunks. Im playing it don't think it is that good definitely not an 8 may be a 6.5. After you met all 3 mii in day delete them. They gave you nothing and made your StreetPlaza big trash. Why they are added to mii pool? I call them fake mii because they give you nothing. the review missed 2 ways to earn extra diamonds. about half the miis I save in a stage give out a diamond as a reward, and when you buy 3000 diamonds you're given a diamond mine which gives out 20 diamonds every day. Good review. 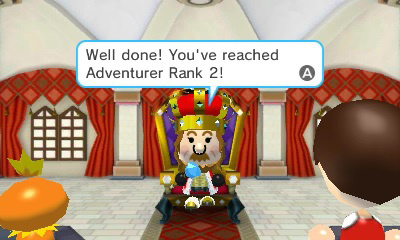 This and Pokemon Shuffle have been the most played games on my 3ds recently. I even decided to cap it at the 3000 diamond limit and for the most part it plays like a regular full price rumble games. With all that diamonds along with the diamond mine and handout from the king and mii, you'll have more than you ever need to progress. @TingLz Okay first off, no 3DS game goes for $60 except 3rd world countries and countries with weaker currency (making it about the same value), so you're really exaggerating there to make your point look better, which is a pet peeve of mine. Anyway as I said before, in this particular instance they did F2P pretty all right. Buying a full version of the game would be more expensive than having it F2P. But like I said I don't want to support it because it'll be very easy for Nintendo to get greedy with it in future games if this F2P business becomes very successful. That's why I refuse to support it. @thedicemaster Wait so the max you can buy is 3000 diamonds and you get a diamond mind for doing so? wow. @Uberchu Nintendo's idea was probably to give people the option to "pay off" the game. by the time you've paid enough to buy a full game they remove the microtransactions and just give you some "premium" currency every day, to make it seem more like a regular/full game. I didn't really like this one that much but I think it was a fine free to play game. It's a shame I couldn't get into it because it seemed to buck the trend of only allowing you to play for a little bit before cutting you off and forcing you to wait or spend money to continue playing. If you are into the type of game it is highly recommended though. The gameplay is sooooo boring but I somehow boot up the game every now and then xD It just looks so good on my new 3DS. and using those leaked codes helps. 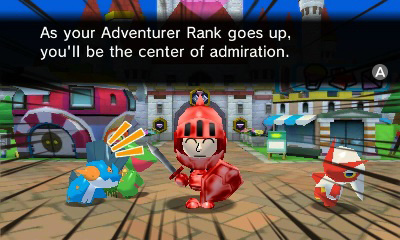 While I really liked Pokémon Rumble Blast, I've been hesitant about Rumble World due to its freemium nature. (Needless to say, I hate freemium games.) I've been so busy with Fantasy Life, I haven't cared to read up on it until now (although I've been seeing it as most people's "Most Recent Game" when StreetPassing). It's nice to hear that the microtransactions aren't as offensive as other games and I really like that $30 ceiling which keeps parents of kids happy they won't get a bill for $100 and keeps people from just buying everything to win over those who would rather play the game to win. I don't say this often about Nintendo these days but good job. I love both this game and Shuffle. Great to play in short bursts, really felt I needed more of those games on my 3DS. Cant wait for Puzzle n Dragons. I think the reviewer of this "review" has been paid to do so. Music judgement is wrong. The music is awful and non-fitting. Game is too repetitive and boring to be explained. Freaking roulette stage-picking system is the WORST mechanic. This game should get a 5/10 with the depth of VERY MEDIOCRE. This game is pants. Shuffle is awesome, though. Well I for one love it . I have Y and shuffle and feel this is another great addition. Thank you Nintend . I think the music is just copy/past from the other rumble game for the 3DS. and you can pay 2 gem to get past the roulette system. I think this may be the worst game I've played on my 3DS... Almost feels like an unlicensed game to me, at times. @kamifox1 I'm reminded of the South Park episode "Freemium Isn't Free" by your comment. Just because a game is free doesn't make it better than a game you have to pay for. @Bass_X0 I... know. That's not even what I said... I said you shouldn't complain about a game you paid nothing for because you shouldn't feel like you're owed anything. You paid nothing for what's actually a decent game compared to other free to play games yet people are still moaning. About what? You can't expect something that's free to be as good as something that you pay £30 or more for, that's just ridiculous. If you want a better game that's similar, pay £30 (or less, as it probably is by now) for Super Pokemon Rumble instead.